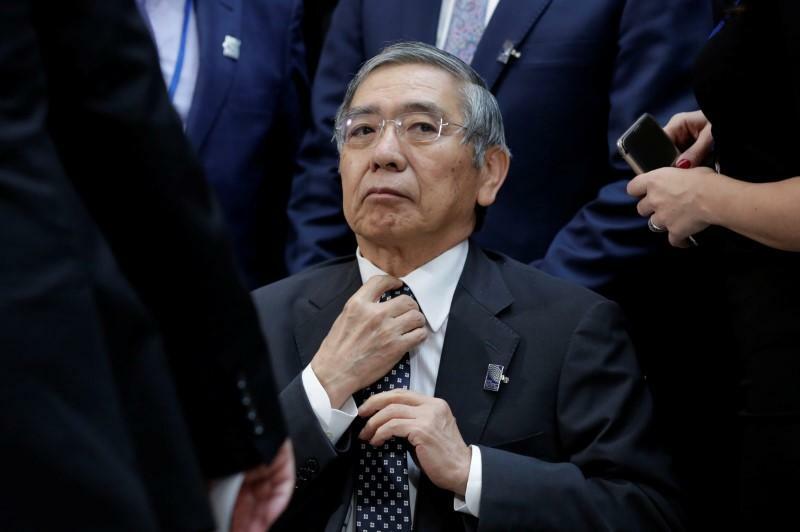 TOKYO (Reuters) - Japan's central bank chief said on Friday it would consider ending ultra-loose monetary policy if inflation hits its target during the year ending in March 2020, in his first comments acknowledging the possibility of a stimulus exit. The remarks sent the dollar lower against the yen and pushed Japanese government bond yields up, on heightened market expectations the central bank could wind down its crisis-mode monetary stimulus through measures such as higher interest rates or a cut in its bond purchases. "The BOJ's board members expect that prices will reach 2 percent around fiscal 2019. If this happens, there's no doubt that we will consider and debate an exit," Bank of Japan Governor Haruhiko Kuroda told parliament. While Kuroda's remarks were broadly consistent with his previous guidance on the conditions needed to unwind the accommodative policy, market participants took particular note of his explicit reference to "an exit". This stoked speculation the BOJ could follow in the footsteps of its major peers in removing monetary stimulus. "The market has been very sensitive about the BOJ's exit from ultra-easy policy," said Norihiro Fujito, senior investment strategist at Mitsubishi UFJ Morgan Stanley Securities. "Until now, the BOJ did not comment on exiting, but since it was reported that he commented on exiting, the market was startled." Kuroda stressed the BOJ's resolve to maintain its massive stimulus programme for now, with inflation distant from its 2 percent target. But he added the BOJ could adjust its yield targets flexibly and won't stick to ultra-loose policy forever. "If economic conditions become favourable and our price target is achieved, we will normalise monetary policy," he said. Kuroda, who has been nominated by the government to serve another five-year term after his current one ends in April, made the comments during a confirmation hearing at the lower house of parliament on Friday. The dollar dropped 0.4 percent to 105.79 yen, edging back towards its 15-month low of 105.545 set on Feb. 16. The benchmark 10-year JGB yield was 1 basis point higher at 0.060 percent, after rising briefly to 0.080 percent. Naomi Muguruma, senior market economist at Mitsubishi UFJ Morgan Stanley Securities, said Kuroda's comments on Friday should not be read as a sign the BOJ is "rushing to exit" its stimulus. "Rather, his comment about an exit offered a perfect opportunity for investors to adjust positions before the weekend," she said. Mitsubishi UFJ Morgan Stanley Securities expects that the BOJ won't tighten policy at least until some time in 2020 as the central bank should examine the impact of a planned sales tax hike in October 2019. With inflation remaining distant from the 2 percent target, the central bank is widely expected to keep its massive monetary easing intact at its policy-setting meeting next week. Still, data out Friday showed core consumer inflation in Tokyo edging up to 0.9 percent in February, as the nation's jobless rate hit a 25-year low of 2.4 percent in January, underscoring Kuroda's optimism. Kuroda's nomination needs approval by both chambers of parliament, which is a near certainty as Prime Minister Shinzo Abe's governing coalition holds a comfortable majority. "If comments are to be taken for face value, it spells a major turning point in BOJ policy," said Daisuke Karakama, senior market economist at Mizuho Bank in Tokyo. Under a policy adopted in 2016, the BOJ guides short-term interest rates at minus 0.1 percent and the 10-year government bond yield around zero percent. Kuroda said the BOJ could debate an exit strategy from its ultra-loose policy and communicate its plan with markets when the appropriate time comes. But he said now was not the time to push for an exit with inflation still distant from the BOJ's target. "It has become clear that changing public perceptions on price moves will take time," Kuroda said. "We'd like to guide policy with utmost focus on meeting our price target, mindful of recent debate on the impact of our policy on the BOJ's finances and an exit strategy," he said.